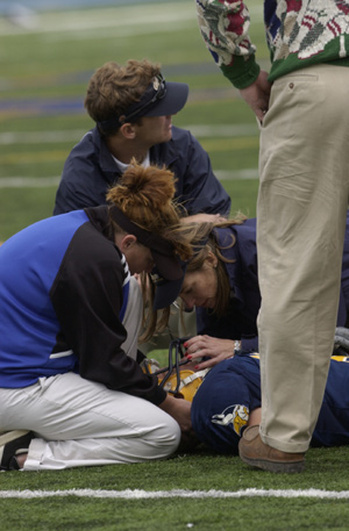 College and High School Athletic Training - Sports and Spine Physical Therapy, Inc.
Sports and Spine Physical Therapy, Inc. provides the highest quality of athletic training services to student athletes. Performance enhanced strength training, especially in the off-season, is the initial foundation for optimized performance in the next season. By getting stronger, our athletes are able to work longer and harder in developing their skills in practice. Our strength plan is sports specific focusing on balance, power, strength and explosiveness. Our Speed Program is also sports specific covering the following: straight ahead speed, lateral speed, back pedaling, first step explosiveness, overall explosiveness, jumping and agility. We help our athletes create more power in each of their sprints and running strokes which therefore increases their speed output. We can improve flexibility, which is so critical to mastery of technique. In addition, flexibility is an insurance package against sustaining a possible injury. Our athletes’ goals are met through a concerted effort with our highly trained clinical staff, our athletes’ parents and coaches. Results are yielded through the one on one relationship between our staff and the athlete, and the shared commitment towards our goals.